Lying at the foot of Mount Meru with stunning views of the mountain and nestled in the small village of Ngongongare, you will find our African View Lodge. Located a good half hour drive from Kilimanjaro International Airport and, likewise from Arusha town, our lodge is the perfect base to start your climbing trips to Mount Meru (4566 m) and Kilimanjaro (5895 m) as well as for safaris. Our mobile tented camp follows the never-ending circle of life in the Serengeti. Throughout the year we choose the most spectacular spots inside the park, as close as possible to the large, migrating herds of over 2 million wild animals. Each tent is equipped with twin beds, bedside tables, luggage racks and, of course, your own toilet and shower as well as a small terrace. Endoro Lodge borders the forest of Ngorongoro Conservation Area and is an ideal midpoint between Arusha and the Serengeti. The lodge’s chalets are comfortably furnished with lovely views across the garden to the forest. For those wishing to stretch their legs after a long drive, the Endoro River Nature Trails offers suitable possibilities for hiking, bird watching and game viewing. Tarangire National Park offers a truly spectacular African landscape. The park is composed of granitic ridges, a meandering river valley and swamps. Huge baobab trees are found throughout the park dominating this unique scenery. The vegetation is a mix of Acacia woodland and seasonally flooded grassland. Elephants, a wide range of antilopes, zebras and many other mammals can be seen here and, recently, packs of wild dogs have been occasionally spotted lying in the shade of a baobab tree. Our new intimate tented camp, inside the boundaries of Tarangire National Park, lies peacefully along a seasonal river bank in the shade of large acacia and sausage trees. Housing only six spacious and comfortable tents, our camp represents the ultimate "African bush feeling". It offers privacy and a personalised service while spending unforgettable nights in one of Tanzania's most scenically beautiful national parks. The exotic island of Zanzibar is located in the Indian Ocean approximately 40 km east of mainland Tanzania. Its cultural heritage, magnificent palace ruins, idyllic beaches and the scent of tropical spices make the island a very special holiday destination. The endless sandy beaches along the east coast are an ideal spot to relax and unwind. In the shade of coconut palms, you will find the charming bungalows of Bahari View Lodge. Bahari means “Ocean” in Kiswahili, the local language. The fringing coral reefs protect the island's sandy beaches from the waters of the Indian Ocean. The restaurant and beach bar are situated in a shady, tropical garden and, with the rooms just a few steps away from the ocean, what better way to enjoy a relaxing holiday! New addition to the African View family since July 2018 – Tarangire View Camp! Our new, intimate tented camp, inside the boundaries of Tarangire National Park, lies peacefully along a seasonal river bank in the shade of large acacia and sausage trees. Housing only six spacious and comfortable tents (9 m x 4 m), our camp represents the ultimate “African bush feeling”. It offers privacy and a personalized service while spending unforgettable nights in one of Tanzania‘s most scenically beautiful national parks. Elephants, giraffes, zebras and antelopes are just a few examples of our permanent visitors which pop by, not forgetting our prolific birdlife! The camp is open year-round except during the long rains in April and May. Tanzania offers a wide variety of spectacular landscapes ranging from Lake Victoria and the savannah plains of the Serengeti to the impressive Kilimanjaro, Africa’s highest mountain. The tropical beaches of the Indian Ocean and the famous Spice Island of Zanzibar invite you to relax and unwind after an exciting safari or a challenging mountain climb. Our lodges and tented camps, which offer great value for money, are perfectly located within reach of all major attractions in northern Tanzania and on Zanzibar. 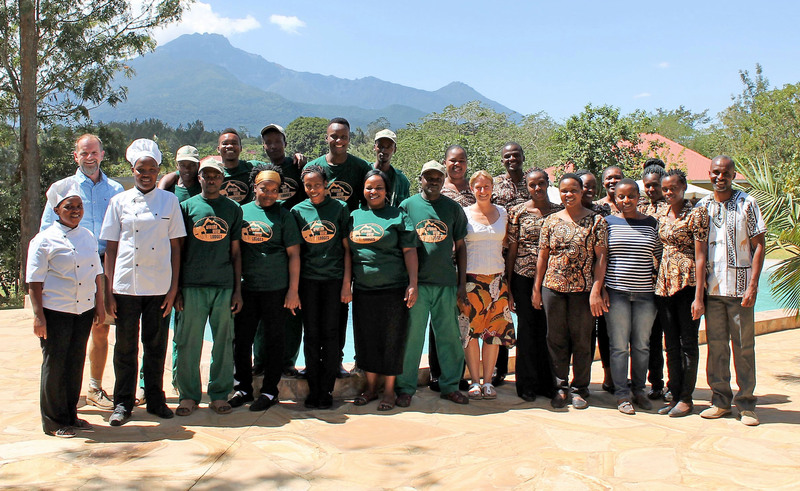 Our teams look forward to hosting you with warm Tanzanian hospitality. Karibuni sana!